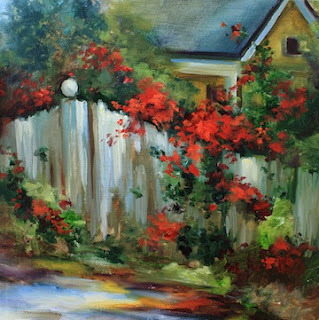 Yellow Cottage Rose Arbor is based on the cottage gardens of Coronado, California - I got lots of great pictures when I was there 2 weeks ago for my annual solo show at Art and Frames by Wood Gallery on Orange Avenue. 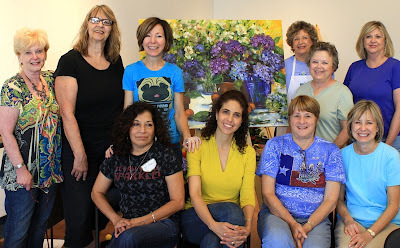 As soon as I got home from Coronado, it was time to pack up the studio and head to Fredericksburg, Texas, where I taught a 3 day flower painting class in the Hill Country. The 12 gals who joined me at The Good Art Company school painted hydrangeas, daisies, and sunflowers. I am pretty sure someone spiked the kolaches, because there was an awful lot of laughing happening! In between painting, we had cheese danish, chocolate cake donuts, apple turnovers, and on the last day J'Lynn even shared her secret stash of chocolate chip cookies! 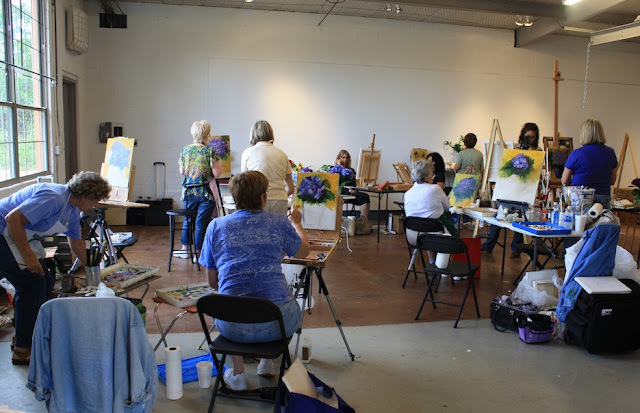 A huge thank you to everyone who came to the workshop, I sure hope you enjoyed yourself and took home some great tools for your painting apron! Thanks especially to Betty, who traveled all the way from Durango, Mexico, by herself, two plane rides, one long car ride, just to study with me. It is a bit humbling when students come from so far to study with you, and I had some lovely ladies from Tennessee, New Jersey, and quite a few from all over Texas joining me this weekend. 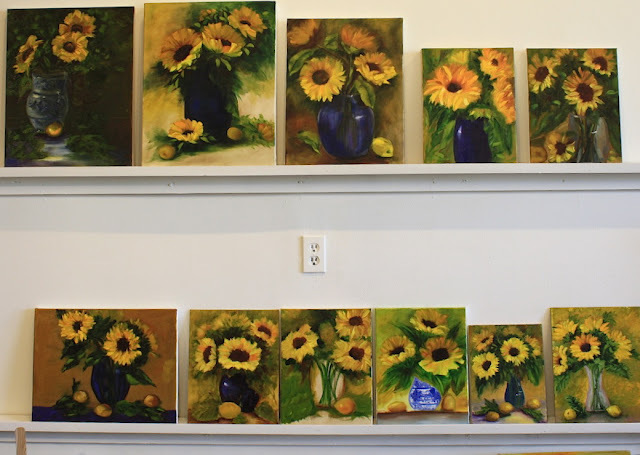 Here's a class group photo for you and a peek at their sunflower hall of fame! We painted fast and loose and had a lot of fun with color. And an added bonus was a pet friendly family reception Friday afternoon after class. The gals brought all their favorite critters, both two legged and four legged, to the event. 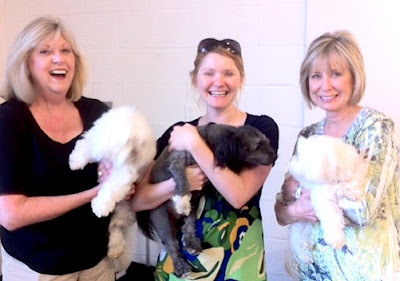 Molly and Morgan, two four footed cutey pies from Tennessee, and Bob the Studio Dog were on paw to greet all their adoring fans and enjoy the special doggy bags Mary Katherine prepared. I could tell from the smacking and gulping those treats were delish! My next workshop is May 12 at the Dallas Arboretum. I sure hope to see you there! The final day of class! 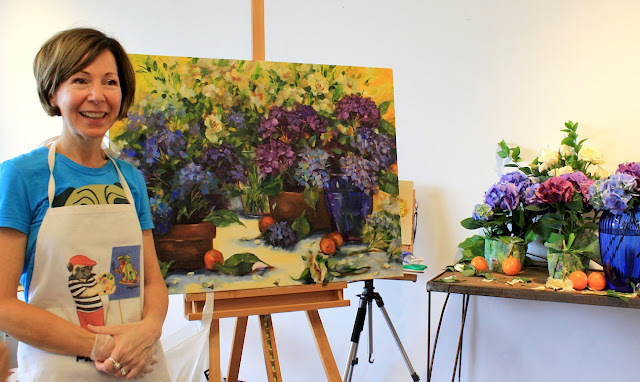 My Sunday demo, Hydrangea Garden, 30X40 - the local grocery had hydrangeas! Hard at work constructing hydrangeas - lovely blues! My students' sunflowers were blossoming all over the place! No shortage of smiles around here! 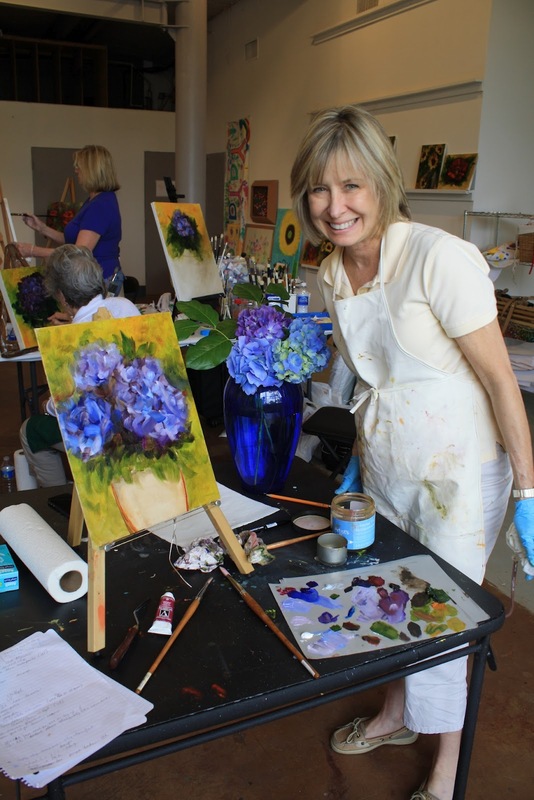 Debra and her lovely hydrangeas! Studio Dog Bob, and Debra and Morgan. Gros bisous, je vous souhaite beaucoup de bonheur et de santé en ce jour de 1 mai. Oh what a fabulous weekend this looks to have been! And I always so love your Coronado paintings; they always just add a touch of home that I love. What fun you must have all had!